Tweet Share There are many approaches to protecting privacy, but many of them run into conflicts, either with existing protections (perhaps especially the First Amendment) or with those who are suspicious of government regulation. But privacy rights do not necessarily need to be protected in a novel new form as a new right – one could instead leverage existing theories of property to do it. There are many approaches to protecting privacy, but many of them run into conflicts, either with existing protections (perhaps especially the First Amendment) or with those who are suspicious of government regulation. But privacy rights do not necessarily need to be protected in a novel new form as a new right — one could instead leverage existing theories of property to do it. Additionally, if a core reason that copyright has always been compatible with the First Amendment is that it is a property right, then perhaps a way out of the conflict between privacy and freedom of speech and the press is to conceive of privacy in the same way — as a property right. Certainly it is already on its way there, as the “right of publicity” in many jurisdictions already implicitly does so, since it provides control over unauthorized commercial use by others. What follows are three approaches the outline some of the benefits of doing exactly this. That the propertarian model of privacy has the full force of the Constitution behind it is evident in the purposes listed in the preamble to the Constitution, in the recurring express references to property, and in the protection of unenumerated rights in the Ninth Amendment. A private firm compiles a computer data base on consumers in order to rent it to direct marketers. Privacy violation? Not if the information was originally provided freely by the consumers (or otherwise lawfully obtained) and all contractual restrictions are observed. But if information was given confidentially, divulgence should be actionable. To be sure, data can be misappropriated, stolen by computer hackers, or used in ways that violate contractual obligations. That is why there are criminal and civil courts. Yovatt brings to light the interesting and important fact that “what we now call ‘unfair competition’ and ‘plagiarism’ and ‘privacy’ were all wrapped together, in Yovatt’s time, under the principle of ‘property. '” It was only later that these concepts were separated. According to one commentator, the most significant aspect of this case and its underlying philosophy is that it rested on a right of privacy, which the court considered a type of property right. 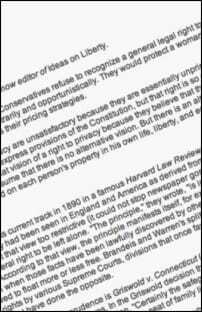 In fact, it appears that until 1890, no English court recognized the right to privacy independent of property rights. The Moore case illustrates the interconnectedness between privacy and property rights. Given the same set of facts, four members of the Court believed privacy rights were jeopardized, while another believed property rights were threatened. Ultimately, the two segments came together to protect the rights at stake. … The most enduring protection for both rights is to view each as indispensable to the other. In “Privacy As Intellectual Property?,” Pamela Samuelson explores the potential benefits and pitfalls of adopting a property-based approach to privacy protections. First, she writes, viewing data about oneself as private property matches an intuition many of us already have. Since people already have the legal right to exclude people from access (journals locked in a desk drawer, papers stored at home in a file cabinet, etc. ), “they may have a sense that they have a property right in the data as well as a legal right to restrict access to it” (1130). Data protection laws reinforce this intuitive sense. This intuitive sense of property persists even though ownership of data is not the core legal framework in American law for dealing with privacy: “Indeed, the traditional view in American law is that information as such cannot be owned by any person” (1131). Although property rights are involved with Fourth Amendment protections, it is not a property right in the information per se, but rather a property right against trespass. The Fifth Amendment (against self-incrimination) protects a liberty interest in a kind of privacy right, but it is not a property right. If a doctor reveals confidential medical information to a newspaper, a patient’s rights “would arise under contract or privacy law, not from the existence of any property rights in this information” (1131). Samuelson suggests that granting individuals property rights in their own data might force companies to internalize the costs of privacy — if individuals retain property rights over their own information, even if gathered without their intervention, the companies would need to compensate them (and get permission) for the use by buying the rights, or forgo using the personal data. It would also have the side benefit of potentially increasing the quality of data collected, since individuals and companies would each have an incentive to make sure data is accurate (1133). Perhaps most importantly, taking a property rights approach would allow market forces and market efficiencies handle privacy concerns, without neglecting the particular desires of individual people, and without extensive (and potentially expensive) government regulations (1135-36). Both Cholpecki and Richmond write from a libertarian perspective, and both believe that connecting the right to privacy with property rights will helps unify conservative and liberal positions into one that can have positive outcomes for everyone. Samuelson approaches the issue from a critical perspective, but outlines many of the important benefits that a “privacy as property” approach might give — and notes that, especially as many American today dislike government-run anything, a system of privacy rights that leverages and extends existing property rules and regulations would likely achieve significant support.